On the side of Entombed, Unleashed and Dismember, Grave should be named as a responsible band for the forming of the Swedish death metal scene. And because of their sound and experimenting ambitions, the most extraordinary band too in this line. After "Into the Grave" which was a strong and impressive debut, they created another death metal classic. 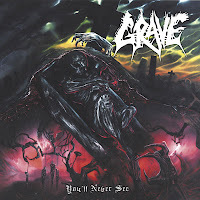 "You'll Never See" was a typically raw and heavy Swedish death album with primitive themes, but even though it could completely define the features of that scene, something more was included. Similar to the firts album, "You'll Never See" sounded more powerful than the other albums made by local bands that time, and that increased it's brutality to some ultimate level. And through that, it reached a very rude and cruel feeling which exceeded even the ordinary primitiveness and cruelty which was so usual in Swedish death metal. The short and sharp-sounding solos borrowed a netherworld-like impression to the music, while the combination of the noisy basic riffing and rude deep growling pulls down the listener with it's heaviness... Into the Grave.